Leeds United are aiming to use the losing feeling they had at Oakwell last Saturday as motivation for their quick return to action tonight in the EFL Championship. The Whites are back at home in a recently rearranged fixture against Nottingham Forest that can see them bounce back up to third place if they can swiftly get back to winning ways following the 3-2 defeat at Barnsley. Head coach Garry Monk is confident that it was just a blip in a typically competitive derby game and he is pleased his team have another game following on so soon to get their teeth into. He said: “It’s a feeling we haven’t had for a while, to lose a game, and everyone wants to ask questions but we’ve been playing at such a high standard that we will have the odd game like this now and then. “We were performing at such a high level and when you get the disappointment it feels very hard to take. “It’s a strange feeling but it’s good to be saying that. We’re doing tremendously well to be where we are and whenever we suffer we always react straight away. That’s the sign of a good team. Monk is likely to make changes to his team after their disappointing display and has options with Pontus Jansson back after suspension and winger Hadi Sacko is back in contention too following his leg injury to freshen up the attack after missing the last three games through injury while midfielder Eunan O’Kane returned from his long absence as a second half substitute at Barnsley and could come back into the starting line-up. Luke Ayling can return to right-back after having an uncomfortable evening at centre-half at Oakwell, but left-back Charlie Taylor is still continuing to battle his Achilles problem and still a way off a first team return. “Pontus has done well for us. Having him back is a boost for everyone,” said Monk. “He comes back into the squad and at this stage you need all your players available, to give you the best option and the best chance. “Hadi’s back involved, Charlie’s still out and Coops (Liam Cooper) won’t be ready but he should be back in training on Thursday. Monk will be looking to utilise his squad with more games in the next eight days coming up away at Sutton United in the FA Cup fourth round on Sunday and at Blackburn, back in the league, on Wednesday week. 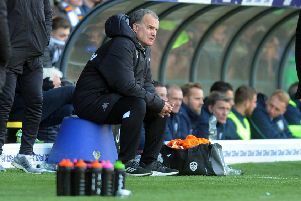 The Leeds boss, meanwhile, is still hoping to bring a couple of players in to bolster his squad this month and just as keen to hold onto his first team group. He is allowing the frozen out Toumani Diagouraga to leave on loan for Ipswich, but has laughed off suggestions that top scorer Chris Wood had attracted interest from a rich Chinese club. “I don’t pay attention to stupid speculation,” Monk said. Forwards appear to be the priority with West Ham’s Ashley Fletcher and Norwich’s Sergi Canos continuing to be linked.